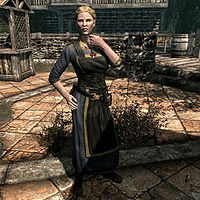 Haelga is a Nord citizen and the promiscuous owner of Haelga's Bunkhouse in Riften. She saved her niece Svana Far-Shield from the orphanage when her parents died, and now has her working as a maid in the Bunkhouse. Relations between the two are rather strained, as Svana believes she is being worked like a slave and that Haelga takes her worship of Dibella too seriously. Haelga's room shows her dedication to her Dibellan Arts: she has a shrine to Dibella, stamina potions, honey, leather strips, a horker tusk hidden under the bed, Falmer blood elixir and even a set of shackles on her bed. She is known to give a mark of Dibella to every one she practices her Dibellan Arts with. The marks are made specially by Madesi, who is unsure what Haelga uses them for, although she offered to show him one day. She's worried that Riften's people would kick her out of the city if her worship of Dibella became public knowledge, and may implore you not to tell anyone: "If word got out that I'm practicing my Dibellan Arts in Riften, they'll run me out of town." Haelga wakes up at 6am to have breakfast, before starting work at 7am in her bunkhouse, where she tends the front desk. At 2pm she goes out shopping in the Riften market before returning to work at 6pm. She finishes work at 7pm and enjoys dinner at the bunkhouse, and then goes out at 8pm to meet Bolli for drinks at the Bee and Barb. She returns home at 12am to sleep. She wears middle class clothes, a pair of fine boots, and an amulet of Dibella. She also carries the key to the bunkhouse, a belted tunic, and a selection of upper-class items and gold. She is armed with a dagger that can be up to elven in quality at level 20. If you approach her, she'll tell you a few things: "New around Riften? Take my advice. Stay at the Bee and Barb... the Bunkhouse isn't for you." and "If you're looking for a bed, this is the wrong place." She may instead ask you, "You looking for something or what?" If Taking Care of Business has been completed, she may also react to seeing you with "Oh, it's you. Come to extort more from me?" Upon ending conversation, she can be found saying, "I don't know why I bother." She'll tell you about the Bunkhouse, should you ask her what the place is. She'll respond, "This heap of matchsticks is what everyone calls Haelga's Bunkhouse. Can you stay here? No. The Bunkhouse is for the working man, not some sort of a luxury inn for tourists." Asking her if she is the only one that works at the Bunkhouse will have her reply, "Of course not. You expect me to take care of it by myself? My niece Svana helps me with the chores. She'd be more help if she kept her head out of the clouds. She's been with me ever since her parents were killed by bandits and she was dropped in my lap." If asked, she'll direct you to a place where you can learn more about magic: "There's a College in Winterhold that teaches magic. It's very secretive, though, and you know how people hate secrets. The Jarl's court wizard was taught there. That one's full of secrets." During the quest Caught Red Handed, Svana will ask you to collect three Marks of Dibella from Haelga's lovers: Bolli, Indaryn, and Hofgrir Horse-Crusher. If you ask her why she hates Haelga so much, she'll explain, "It's not just the work, it's everything about her. She's disgusting. I think she takes her worship of Dibella a bit too seriously. Do you know she's slept with three different men in the last month alone? What kind of a woman would do such a thing? Just for once, I'd like to see her squirm... to rub her nose in it." Once you've done gathered the Marks, confront Haelga by saying, "I believe these are yours?" and she'll be shocked: "What? How... where did you get these?" She'll continue, "No, don't tell me. I don't want to know. Look, we need to keep this quiet... between you and me, okay. No one else needs to know about it. If word got out that I'm practicing my Dibellan Arts in Riften, they'll run me out of town." She'll give you a magic scroll: "Here, take this and don't mention a word of this to anyone, especially Svana!" When you are handing out religious pamphlets to the citizens of Riften, you may give Haelga one. She doesn't seem interested, though: "Huh? Oh. Sure, whatever. I prefer Dibella's teachings myself." Caught Red Handed: Gather three marks of Dibella to help Svana Far-Shield against Haelga. Taking Care of Business: Collect some debts for the Thieves Guild. "Aunt Haelga, why you... demean yourself with these people you barely know?" Svana: "Aunt Haelga, why you... demean yourself with these people you barely know? They show no real love for you." Haelga: "It's only a bit of fun. You're a lovely young thing, you should try it sometime." Svana: "No! I'm saving myself for someone special. Someone who loves me dearly." Haelga: "You mean Sibbi? You must be joking! All he wants to do is bed you and be done with it. You may as well get it over with and let him." Svana: "You're wrong! Sibbi and I are in love and you're just jealous!" Haelga: "Svana! Has that skooma-addled idiot Niluva paid us her rent yet? Or does she have more excuses?" Svana: "She said she'll have it soon. She still has her job at the meadery for now, so she'll be able to pay us." Haelga: "Why do you insist on defending that woman? All she does with her money is spend it on that Dark Elf garbage!" Svana: "Just be patient, aunt. She'll have it, I promise." Madesi: "Lady Haelga, so pleased to see you. Your Marks of Dibella are ready." Haelga: "Oh, splendid! I can't wait to use them." Madesi: "Begging your pardon milady... I know these have something to do with Dibella, but whatever are they for?" Haelga: "Maybe I'll show you one day, Madesi. Have them delivered to the Bunkhouse, won't you?" Haelga: "So, Tythis... you coming by the Bunkhouse later?" Tythis: "Of course. I rented a bed there. Where else would I sleep?" Haelga: "I have plenty of room in my bed." Tythis: "Good, that must be very comfortable for you. I think mine's a bit too small. Perhaps we could trade?" Maven: "Haelga, I like you, so I'm only going to say this one time. If you ever try and 'practice the Dibellan arts' with Hemming again, I'll make sure that pretty little face loses its beauty." Haelga: "He wasn't protesting, Maven." Maven: "Of course he wasn't you stupid whore; he's a man. Now I'm not going to warn you again. Is that clear?" Bolli: "Haelga, we need to stop seeing each other." Haelga: "Oh, Bolli you silly man. You weren't saying that when you were licking that honey off my..."
Bolli: "Haelga! That's just it. I can't keep up with you. Your Dibellan techniques... they're exhausting." Haelga: "Is it really me, or is it your wife? You need to make a choice Bolli. The honey or her." Haelga: "When are you going to take me away from here Bolli?" Bolli: "I told you, I can't just pick up and leave. I have my wife, my business... not to mention you have the Bunkhouse." Haelga: "That old place? I could care less about it. Its [sic] you I want, Bolli." Bolli: "I... I'm sorry Haelga, I can't. Not yet." Este artigo relacionado a Skyrim é um rascunho. Você pode ajudar expandindo-o. Esta página foi modificada pela última vez à(s) 20h54min de 28 de março de 2016.